Wall Street is down on the food and beverage giant, and that could spell opportunity for long-term investors. Nestle (NASDAQOTH:NSRGY) shareholders haven't benefited much from the recent stock market rally. In fact, the food and beverage giant's stock is badly underperforming broader indexes over the past one- and five-year time periods. Investors moved away from Nestle as its sales growth fell below management's 2016 forecast. Worse yet, the company sees 2017 as another year of subpar gains. The slowdown might set the stock up for solid long-term gains from here, though, and so investors should consider buying shares while they're relatively cheap. Below are a few of the best reasons to consider adding Nestle to your portfolio today. The company's latest expansion pace may have missed expectations, but it was still good enough to beat nearly all snack and food rivals. Nestle's organic growth was 3.2% over the past 12 months, and while that represented a slowdown from the prior year's 4.2% gain, it surpassed Unilever (NYSE:UL) and its 2.1% food products gain, and J.M. Smucker's (NYSE:SJM) slight decline. The market-share boost is strong evidence that Nestle is succeeding at staying one step ahead of peers with a robust pipeline of innovative food and drink launches. In fact, almost one-third of sales come from products, like the recent Nescafe Gold Barista brand, that were released or improved over the last three years. While Nestle can't do anything about weakening industry trends, it can press its innovation advantage so that it can quickly return to its target organic growth rate once market conditions improve. Like peers, Nestle is keen on reducing costs during this time of slow industry growth. It has made decent progress on this score and pushed operating profit up to 15.4% of sales from 15.1%. Some of the biggest cuts included removing slow-growing brands and trimming production and overhead expenses. The company is choosing to be less aggressive here than rivals, though, which CEO Mark Schneider said in a recent conference call with investors is a strategy aimed at protecting long-term growth. Speaking about cost-obsessed peers, Schneider said, "There is a price that companies are paying when it comes to organic growth...you can save cost only once. Then the question is, where is the organic growth, going forward?" Nestle's aiming for a more balanced approach that sacrifices short-term profitability gains for what ideally will be sustainable growth ahead. Yes, it is cutting costs, but executives are also significantly boosting marketing spending to support their biggest brands. The payoff for this strategy should show up in higher profit margins and faster growth once the industry returns to a more robust expansion pace. Nestle is a cash-generating machine. Free cash flow rose at a faster pace than sales in the past year as the company hit a five-year high on its cash flow efficiency figure. These gains give management plenty of ammunition to fund steady dividend increases, which they prioritize over all other capital returns. "We are committed first and foremost to a very stable and growth-oriented dividend policy," Schneider recently told investors. NSRGY Dividend Yield (TTM) data by YCharts. As a result, income investors have good reason to prefer Nestle over peers. 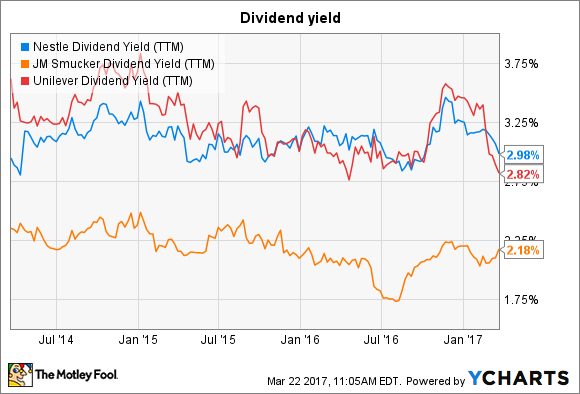 It pays out a greater portion of earnings as dividends, and its 3% yield beats Unilever's 2.8% and trounces J.M. Smucker's 2.2%. An usually strong dividend might give long-term investors just the type of patience they need to wait out what Nestle expects to be another unusually weak fiscal year ahead. 2017 organic growth will likely be 3% for the second straight year, they predict, before the company speeds back up to a roughly 5% pace beginning next year.